These rules were taken from Rugby Sidestep Central and were not written by LSU Rugby. It is understood that these are the very basics of rugby, but to those that have never seen the game before it is a good place to start. 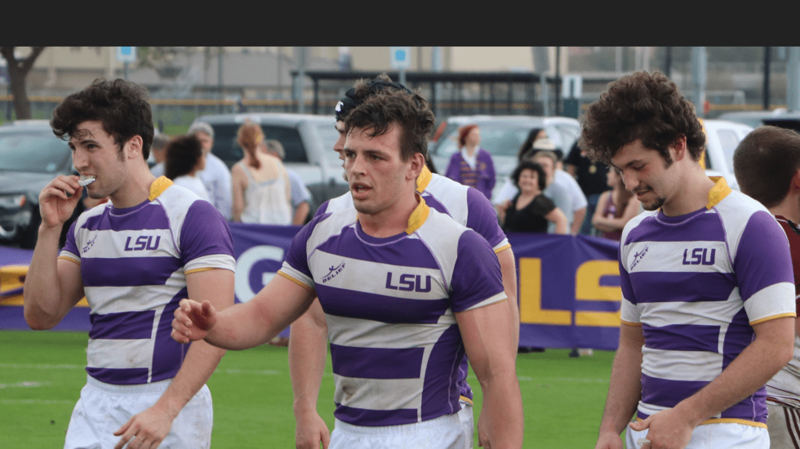 LSU Rugby also suggests watching games on YouTube for more exposure to the sport and rules of the game. When you know this very basic rugby information you may be able to make some sense of what may appear to be total chaos – a game of rugby. The object is to beat the opposition by scoring more points. You do this mainly by scoring tries. You are awarded 5 points for each one. You get a try by grounding the ball in the opposition’s in goal area. Roughly speaking the “in goal” is the area marked out at each end behind the goal posts. You can also get points by kicking at the goals. It involves kicking the ball both between the uprights and over the cross bar in a number of clearly defined situations. Score as many tries as possible. The nearer the posts the better. Any player may score a try… you feel terrific when you do it! The ball must stay in play (not go over the touch lines) and must travel a minimum of 10 meters. A line on the pitch shows this distance. During general play the team with possession of the ball are allowed to carry, pass or kick the ball. Any player may carry the ball. You may carry it pretty much any way you want. You don’t bounce the ball and you must not stuff it up your jumper – or down your shorts! You may carry the ball in two hands. I call it a two hand carry. Or carry it in one hand or arm. I prefer what I call the one arm carry. There is no restriction on the number of steps you can take. There are no limits either, in terms of the time or distance you carry. You may carry it in any direction. Players in the other team are allowed to tackle, hold, push or grasp the ball carrier but must not tackle or obstruct any other player. None of your team are allowed to obstruct opposition players, including when they are attempting to tackle your ball carrier. When you’ve got the ball run straight as you can towards their in-goal – but it’s good if you are elusive! Throwing, passing or giving the ball. Any player may pass, throw or give it to any another player. It’s called passing. Usually you will try to make sure it goes to one of your team mates who is in a better position to do something positive with the ball. Remember, your team wants to get the ball onto the opposition’s goal-line or into their in goal area. The only restriction is that the ball must go across field or backwards. Never forwards. If your hands are judged to have directed the ball forward it is a “forward pass” and play may be stopped. Sometimes you may direct the ball backwards but because of your momentum the ball travels forwards. This not a forward pass and play will continue. Remember team-mates, pass to them if they are better placed. Any player may kick the ball any distance in any direction. If you are holding the ball you may place or drop it onto your foot and kick it. Any safe way is allowed. Forwards, upwards, along the ground, over your shoulder are all fine. You usually kick for tactical reasons. Generally speaking team-mates should be behind the kicker when the ball is kicked or they will be “off-side” and may give away a penalty. There are different ways of kicking, suitable for different situations. You will generally kick forwards. You want the ball to be as close to their posts as possible and as far away from your posts as possible (so you are more likely to be next to score points). You kick to gain ground or to avoid being tackled. Once you have kicked you are no longer the ball carrier and must not be tackled. Kicking usually gives away possession of the ball to the opposition. You would only kick to avoid being tackled if you are isolated from supporting team mates and likely to lose possession deep in your own territory. If the ball stays within the playing area anyone who is “onside” may pick it up and continue playing. If the ball goes over the touchline (“goes into touch”), play is restarted with a lineout. Any player may attempt to score points by kicking a dropped-goal (field goal) during general play. This is done fairly infrequently. Play is continuous unless the rules are broken or the ball goes out of the field of play. From time to time knots of players form spontaneously and become involved in contests for possession of the ball. When the ball is touching the ground it’s called a ruck and players must bind together and attempt to gain possession by pushing and stepping over the ball (rucking). If the ball is off the ground it`s called a maul. Players must be bound together. They push and grapple, attempting to gain control of the ball (mauling). A maul must keep moving or play will be stopped. Even when the rules are broken play might continue if that is an advantage for the opposing team. If there is no advantage a penalty kick is awarded for a serious offence or a scrum is set up for a minor offence. A scrum is when the 8 forwards from each team pack down, head to head in one mass. The ball is put into the center of the mass and the players attempt to win control with their feet and legs. No handling in the scrum! Play also stops when the ball goes out of play over the touch-lines. It is restarted with a lineout where the ball is thrown in between the two lines of opposing players who leap to catch it.